The focus of our family Christmas traditions, the tree is traditionally decorated with baubles, pine cones, stars, and streamers. Underneath the tree we nestle our gifts. "Mom" has bought me a huge, fresh-smelling, scratching post with many shiny dangling toys. There are lots of levels of "shelves" - ideal for napping or hiding, depending on my energy level. At night, I am intrigued by flashing fireflies that flit all over it and I must chase them. I am the hunter and protector of the household! At the bottom are all these boxes I can also hide behind - some with ribbons and strings I can bat with my paw or chew. Sigh . . . I think you can see the problem . . . Since I am not about to give up my Christmas Tree, and since I am (supposedly) smarter than the cat, it falls to me to have my Christmas Tree and make it cat-proof too. I wish I could just put up a big "STOP" sign that my cat would respect and my problem would be solved. Alas, life with my cat is not that simple :-). Some tips avoid a problem — and some eliminate a problem. Pick an area where the tree can be enjoyed by the family without becoming a “climbing toy” for your cat. Try to place the tree near an outlet so you don't have to run electrical cords long distances. 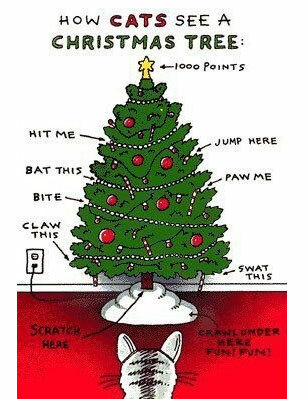 Use a very large base on the tree to help keep the cat from knocking it over. To prevent your tree from falling over when an inquisitive kitty decides to become a tree-climber, fasten the tree to a hook in the ceiling with monofilament fishing line. Cover the opening to your tree stand. The chemicals added to the water to help the tree live longer and tree resins are both toxic to your cat. Sweep up pine needles immediately. A cat can eat one and it may cause vomiting or gastric irritation. There is even the possibility that the sharp point of a needle can pierce the throat or intestines. Lay a carpet of aluminum foil under the tree. Many cats hate to walk on it. Prop a few empty soda cans in the lower branches of the tree. If your cat starts to climb the tree, the sound of the cans falling to the floor may startle the cat just enough to deter it from trying again. Don't hang breakable dangling ornaments on low branches. Any self-respecting kitten or cat will think you have hung the dangling balls as toys just for it to play with. Also, don't use any decorations that are small enough to swallow - especially on those tempting lower branches. Attach the ornaments to the branch securely using string or ribbon. Don't use hooks as these can be chewed or even swallowed, injuring the cat's mouth or throat. Do not use tinsel on your tree! Every year, vets have to perform surgery on cats who have ingested tinsel which has then become tangled in the cat's digestive system. Cats love to play with twinkling Christmas lights. If you are not present, turn the lights off or choose the non-twinkle option. Cats will chew on the electrical cord to the lights. Spray the cords with "Bitter Apple" to further prevent the cat from biting them. You can also use deodorant spray, as cat's dislike the taste of it too. Bundle the cords together leading from the wall plug to the tree and then duct tape them to the floor or baseboards. Unplug the light cord from the wall when not in use. Some cats can be discouraged from climbing the tree by spraying the same "Bitter Apple" around the base of the tree. Cats will also play and ingest the ribbons on presents. Wrap your gifts without any ribbons, especially any long curly streamers. Dispose of all wrapping as soon as possible after opening your gifts. Check inside any empty boxes before throwing them out to make sure a curious cat or kitten has not chosen it as a terrific hiding place. Have a safe and happy Christmas . . . and if all else fails, be philosophical about your cat and the Christmas tree. Be safe, not sorry . . .